Congratulations to Paul Casey on his victory at the Valspar Championship! The Englishman is the first to win a back-to-back Valspar Championship. 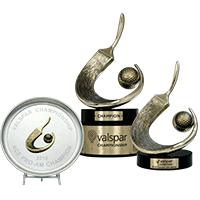 The trophy Paul Casey has taken home was designed by Malcolm DeMille, and is a modern cast bronze sculpture that captures the essence of the Valspar branding with a dramatic brush stroke painting a golf ball. The Pro-Am winners also took home sleek award trays that incorporate a 2-Dimesional replica of this stunning sculptural Trophy.